Early Exposure To Bacteria Protects Children From Asthma And Allergies : Shots - Health News It was widely thought that the grunge in inner-city housing was causing high rates of asthma. But now it looks like being exposed to just the right kinds of bacteria and vermin actually helps. 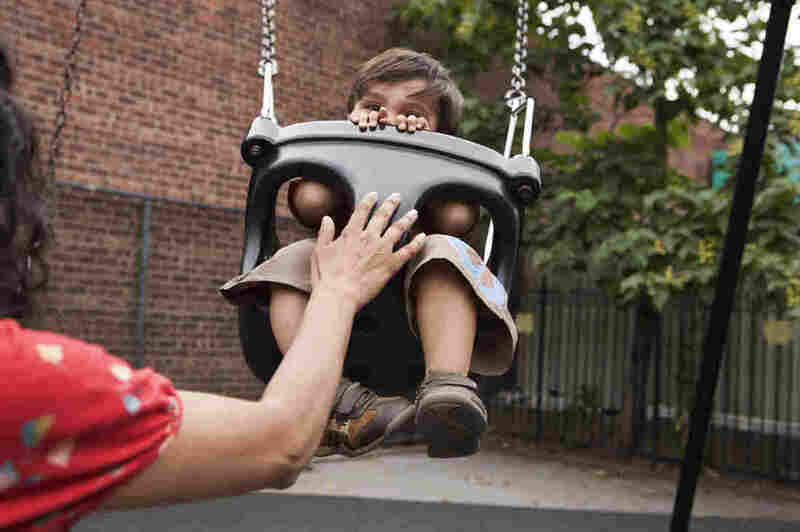 To keep children healthy, it may take a city that's dirty in just the right way. Babies who are exposed to both bacteria and allergens in the first year of life are less likely to develop asthma and allergies, a study finds. It's the latest wrinkle in the hygiene hypothesis — the notion that exposure to bacteria trains the infant immune system to attack bad bugs and ignore harmless things like pollen and cat dander. But what's interesting about this study is that it gets specific; not just any old germs or allergens will do. Inner-city children who were exposed to cockroach, mouse and cat allergens in the first year of life had less wheezing at age 3. And children exposed to a wider variety of bacteria, especially those in the Bacteriodes and Firmicutes groups, were less likely to develop allergies or asthma. Children exposed to both did best of all. "It adds a degree of precision to the broad concept of the hygiene hypothesis," Dr. Anthony Fauci, director of the National Institute of Allergy and Infectious Diseases, tell Shots. And it helps solve a mystery. If the hygiene hypothesis is true, children who grow up in urban housing where cockroaches and mice are common should be less likely to have allergies and asthma. But they're actually more likely to be sick. "We've talked for a number of years about how the inner city really does contradict the hygiene hypothesis," says Dr. Robert Wood, chief of allergy and immunology at Johns Hopkins Hospital and an author of the study, published Friday in the Journal of Allergy and Clinical Immunology. "There's such a high rate of allergies and asthma in the inner city. The inner city must be a very dirty area where kids must be protected." As a result, cities have made efforts to clean up inner-city housing in an effort to reduce the toll of asthma. But instead it looks like as long as you've got just the right allergens and bacteria, dirty is good. Wood tells Shots: "That those were very protective is a big surprise." The scientists have been studying children in Baltimore, Boston, New York and St. Louis for eight years. To find out this latest bit, they had to go back and test dust samples gathered in the children's homes when they were babies, looking for allergens and bacterial DNA. "It's the lack of those protective bacteria that may be the most interesting thing," Woods says. This of course will have parents thinking that it's time to order up some cockroaches, mice and germs when they bring baby home from the hospital. "No, no, no," Fauci says. Though there is increasing evidence that exposing infants to a variety of foods can reduce the risk of food allergies, the idea of doing the same with a specific cocktail of germs and allergens needs to be tested in animals and in human clinical trials before it can be recommended, Fauci tells Shots. Efforts to try to do that by giving pregnant women and babies probiotic bacteria hasn't panned out, Wood notes, so more work needs to be done. "We still believe that in kids with asthma that these allergen exposures are really unhealthy," Wood adds. "But it would appear that if we cleaned things up as a preventative measure it would backfire terribly."